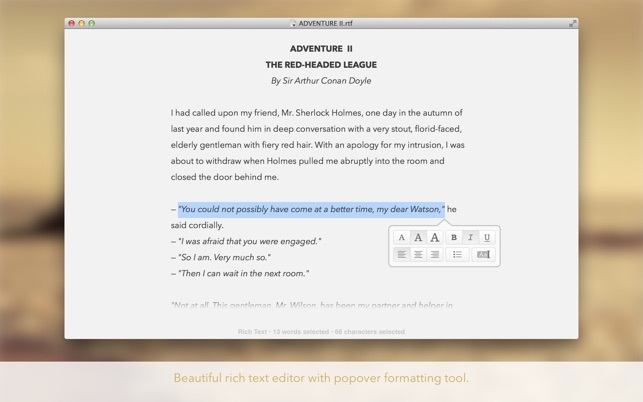 Byword makes writing notes and long-form texts easier on your Mac. We are proud to provide a super friendly customer support over email. If you have suggestions or questions, please contact us using one the methods below. I am a casual writer. 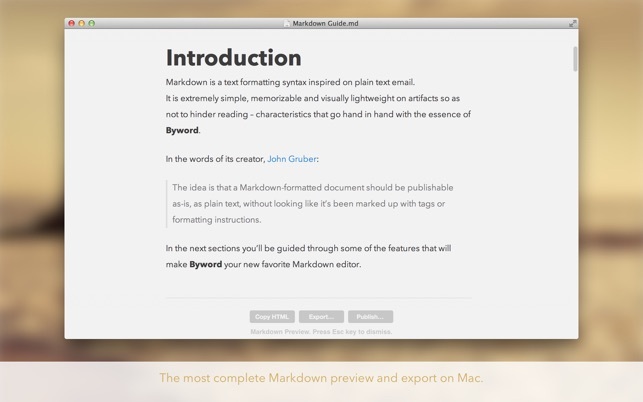 I like to write, and I like to write in markdown, so I don't need anything super flashy in a markdown text editor. My previous favorite editor was Ulysses, but their recent business practices left a bad taste in my mouth, so I went on the market to look for a replacement. I tried a LOT of different text editors. And many are very good. But Byword is really, really great. It’s very simple and straightforward, and it lets me write the way I want to write. Just simple flat text files that I can imbed pictures in for my journaling. That’s all I want, and Byword does this for me wonderfully. I also like that I can change the editor font to what I want. One of the big contenders I was considering didn’t let me do that, and that was the deciding factor in favor of Byword. 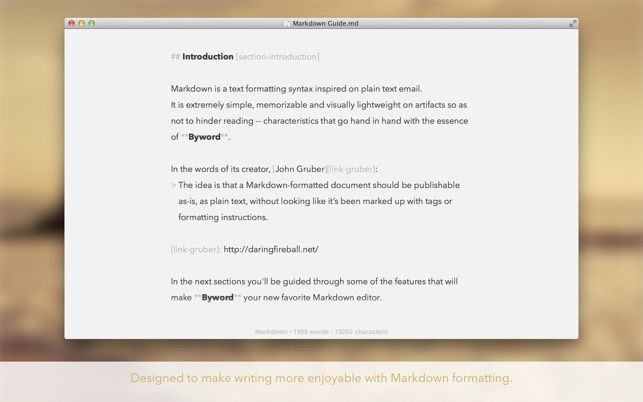 So I am now a happy markdown text journal writer again! Just so long as Byword never becomes subscription-based, I will be a happy customer. 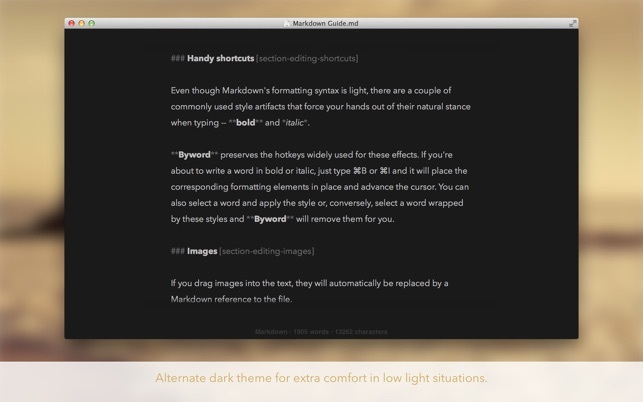 ByWord has proven to be one of the best "minimilistic" apps for writing. It does a wonderful job for what it was built to do and doesn’t try to do more like many other apps in the same category. My only problem that I have isn’t with the app at all. It is with the developer. Their support is not nearly as good as the quality of their design and development. I have emailed them 3 questions, 1 as old as 2016 and NEVER recevied a response. I also had to purchase the app twice because of this. Their flat out ignorance to their customer should stop you right now from clicking the Buy button and that is the ONLY reason. Who knows maybe, hopefully, they will respond to this review becasue they haven’t updated Twitter in almost a year and emails just get delivered to account that they never look at. My writing has been scattered all over the place - Pages, documents, cloud - and I am completely disorganized in trying to get them together in one place. Then along comes Byword and I can write so easily, title it and keep it on the Byword app. I think. My problem is that Byword is part of Pages and the ‘Cloud’ thing and I would like it as a separate icon on my side bar so that I can open it without going into Pages. Any idea if this can be done? I thought I could go through the other places and put all scattered writings into the Byword but not sure I can because I moved one but it moved out again and back into the Cloud, As a writer, I don’t spend too much time using by beloved Mac for other things but this is one thing I would like to get straightened out. Any help out there?